Orienteering is a sport that requires navigational skills using a map and compass to navigate from one point to another in unfamiliar terrain. Participants are given a map, usually a specially prepared orienteering map, which they use to find control points. It was originally a training exercise for military officers, but it has now become a federated sport. But many times, orienteering is included in adventure raids or mixed with other sports, as horse riding or canoeing. Orienteering maps are very detailed topographical maps (they show hills and valleys). Their scales are 1:15,000 or 1:10,000, wich means every cm in the map equals 15.000 or 10.000 cms (150 or 100m) on the terrain. 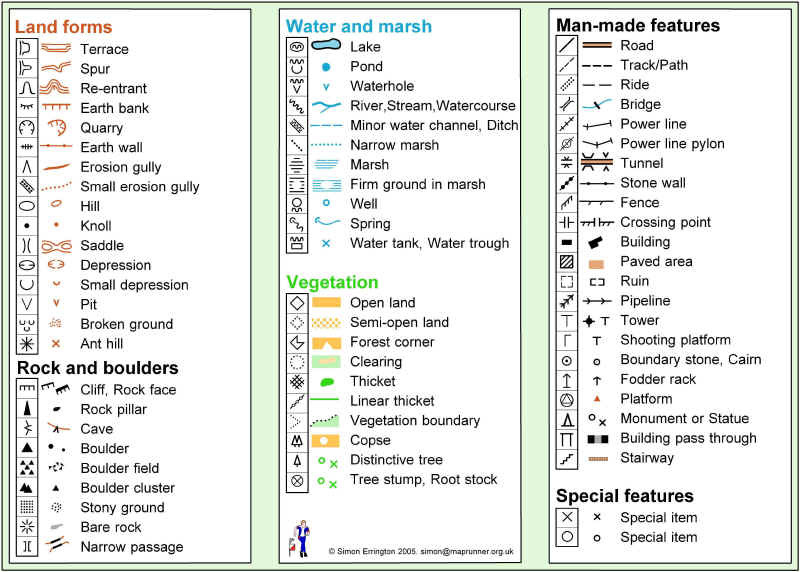 Map symbols are standardized by the IOF, and designed to be readable by any competitor. The orienteering course is marked in purple or red on a map. A triangle is used to indicate the start and a double circle indicates the finish. Circles are used to show the control points. Every other part on the map (rivers, roads, etc) has a specific colour. Brown symbols are used for landforms such as contour lines, small knolls, ditches, earthbanks. Blue is used for water features: lakes, ponds, rivers, streams, marshes. Yellow is to show vegetation - specifically for open or unforested land. The density of the yellow color shows how clear the area is: brightest yellow for lawns, pale yellow for meadows with high grass. Green is used to show vegetation that slows down the passage of an orienteer. The darkest green areas, called &quotfight", are almost impassably overgrown. White on an orienteering map signfies forest with little or no undergrowth - forest that an orienteer can run through. Purple (or red) is used to mark the orienteering course on a map. Conditions that are specific to an event (such as out-of-bounds fields in which crops are growing) are also designated in red or purple. Control points are marked in the terrain by white and orange "flags". Each competitor must carry a control card, and has to present it at the Start and hand it in at the Finish. The control card is marked at each control point to show that the competitor has completed the course correctly. (Usually with needle punches, but most events now use electronic punching). The winner is the competitor who has found and passed through all control points with the fastest time. There are maps on the bottom sides to show you how the racer is progressing from one control point to the next one.